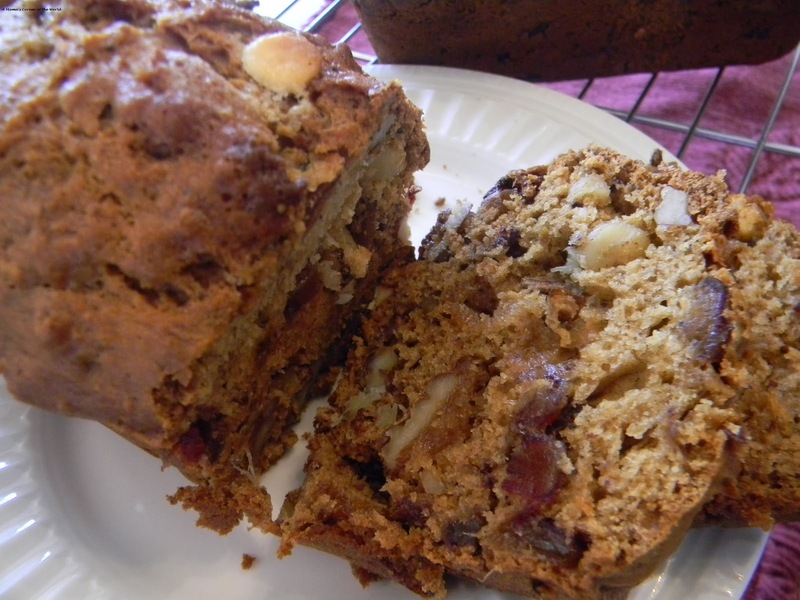 Date nut bread is my favorite quick bread. I make loaves of it during the holidays for gifts (and too many extras for myself!) As I considered the Letter D this morning for today’s entry in the Blogging from A to Z Challenge—I knew that I needed to make date nut bread—but, I didn’t want my usual holiday date nut bread. I wondered what would happen if I added my favorite Chai latte flavors to my favorite bread? How does White Chocolate Chai Date Nut Bread sound? Today, D is for Dates—and this is my new favorite quick bread recipe! Today, I used brewed Chai Latte from my coffee maker—but, making your own Chai Latte is really easy too. This recipe has just a hint of spices that adds something special to the bread without turning it into a spice cake! Prepare Loaf Pans and Preheat Oven. Preheat oven to 350 degrees. Lightly grease the bottoms and sides of three mini loaf pans or one large loaf pan. Soak the dates. Bring the chai latte to a slight boil. Stir in the chopped dates and remove from heat. Cool the date and chai mixture until just lukewarm. Mix the wet date nut bread ingredients. Cream brown sugar, sugar and butter in a small mixing bowl until blended. Add the egg and beat the mixture until smooth. Beat in the date/chai mixture until blended. Prepare the flour mixture. In a large mixing bowl, combine flour, baking soda and salt. Mix the dry ingredients thoroughly. Combine the wet and dry ingredients. Stir the date/chai ingredients into the flour mixture until just blended. Do not overbeat—the date nut bread batter should be lumpy. Fold in white chocolate chips and nuts. Bake the White Chocolate Chai Date Nut Bread loaves. Pour batter evenly into three greased mini-loaf pans. Bake loaves about 45-60 minutes for mini loaves. A wooden pick inserted in center should come out clean. One large loaf needs about 60-75 minutes. Cool and Slice. Remove the White Chocolate Chai Date Nut Bread from oven and cool in pans for about 15 minutes. Remove loaves from pan and cool completely on wire rack. I like to wrap the loaves in foil and wait to slice for about 24 hours. Serve with a cream cheese spread.